MIT’s housing situation for next year is rife with unknowns, especially regarding how many students will be housed on campus, and where. 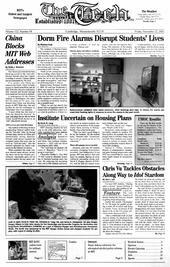 One certainty remains, however -- MIT will not allow crowding for 2003-2004. “No,” said Dean for Student Life Larry G. Benedict. “Not if I’m going to work here. Chancellor Phillip L. Clay PhD ’75 first vowed to eliminate crowding in Institute housing early last year. By reducing the incoming class size to 980 students and housing seniors in various graduate dormitories and members of the Kappa Alpha Theta sorority in Sidney-Pacific, Clay achieved his goal. However, with only 295 students currently pledging fraternities, sororities, and independent living groups, MIT may need to find extra space on campus, barring an extraordinarily successful spring rush. David N. Rogers, director of FSILGs, said he did not expect many more pledges later on this year. Moreover, some pledges will inevitably remain on campus. Phi Beta Epsilon, for example, has more pledges than it will have empty beds next fall. Other students may simply choose to remain on campus, since nothing technically requires them to move after pledging. Denise A. Vallay, assistant director of undergraduate, summer, and guest housing assignments, said MIT was worried that too many students might remain in dormitories next fall. Emily E. Cofer ’04, Dormitory Council housing chair and chair of the Undergraduate Association Committee on Housing and Orientation, said she was confident that the current availability of on-campus beds and MIT’s possible actions for next year would be sufficient to ensure no crowding. With the potential for more FSILG pledges during January’s Independent Activities Period and the near-guarantee of Cambridge-MIT Institute exchange students living in FSILGs as they did this year, Cofer said she did not expect the system’s capacity to be a problem. Benedict attended a Wednesday meeting to discuss possible on-campus housing plans, and he said MIT is currently looking at a range of options for next year. One option is to reduce the incoming class size even further, Benedict said. “How many of those 295 are really likely to move off campus?” he asked, saying that MIT’s estimates of this number could impact the class size. Vallay, too, said that MIT was trying to plan based on early estimates of off-campus moves and the potential for next year’s Senior Segue, but that her office had “no plans” to offer some sort of incentive to encourage students to move out of dormitories and into FSILGs. FSILGs, however, certainly have an incentive to encourage their pledges to move off-campus. While MIT will continue to offer subsidies for empty beds through the 2004-2005 academic year, Institute funds fall short of what a resident would pay. Rogers said MIT is funding 240 empty beds this year, but the maximum number of allowed empty beds will decline each year, as will the funding. In addition, MIT is discussing the possibility of revising the Senior Segue program, where rising seniors who intend on completing an MEng are allowed to live in graduate dormitories. “They’re working now as we speak to evaluate the program,” Benedict said. Clay’s original plan to keep the Senior Segue for three to five years still stands, Benedict said, but he expects some changes to the program, including moving the sign-up date earlier. Last year, many students had already made their housing plans by the time the Senior Segue was made available. Barun Singh G, a co-chair of the GSC housing and community affairs committee, and Nelson C. Lau G, a Tang Hall graduate coordinator, are working with Benedict’s Housing Strategy Group. Dormcon is also involved in the Housing Strategy Group, but Cofer said that “right now the focus in Dormcon is on trying to preserve what’s left of dorm rush,” citing the group’s ongoing petition to change the dormitory rush process for next year. Lau is chair of an Housing Strategy Group subcommittee evaluating the Senior Segue. He said that Benedict and Dean for Graduate Students Isaac M. Colbert seemed “pretty serious” about focusing on the MIT community’s priorities for housing. “It’s a good avenue for them to see what the hot issues are that need to be tackled,” Lau said. The Housing Strategy Group was formed last year after Clay’s no-crowding announcement, in part to address the need for more long-term housing strategy, Singh said. Its subcommittees are working on summer housing, evaluating the Senior Segue, graduate rent, family housing, and non-Institute off-campus housing. “Evaluating Senior Segue will be tricky because, while grad students want to very earnestly do their part to help overcrowding, at the same time we don’t want to lose any more beds that grad students sorely need,” Lau said. “We also want to see the administration make more of an effort to either build new housing for undergrads or keep enrollment rates steady, and help the FSILGs more strongly to rebuild their rush,” Lau said. He said he hopes that in a few years, when the new housing system is more stable, it will be easier to make better decisions. Christina E. Silcox G, the second co-chair of the housing and community affairs committee, said that the GSC maintained its long-held position that MIT should not take graduate beds if there are openings in the undergraduate system, as there are currently. Moreover, she said the GSC would continue to fight the administration’s perception of graduate dormitories as a buffer for fluctuations in class size, transfer students, and students who de-pledge FSILGs. Although Sidney-Pacific has more than 100 empty beds this year, this has been largely blamed on the way the housing lottery was run -- many students had already signed off-campus leases when notified of their room assignments in August. With so many uncertainties for next year, Benedict said MIT would continue to discuss housing options for approximately another two months, but he stressed that “there’s not a firm deadline.” Still, Benedict said that by the beginning of February, MIT would probably need to begin finalizing plans for next year.